Sunset is a wizard and magnificent period of the day. The lights are changing so fast, and the diversity of the colors can easily enchant anyone. You can find no people who are not interested in this marvelous natural phenomenon. Are you planning a romantic hour with your dear partner? Or are you interested in photography, and do you want to make some fabulous photos of the changing lights? If your answer is ‘yes’, we have a great offer to you! 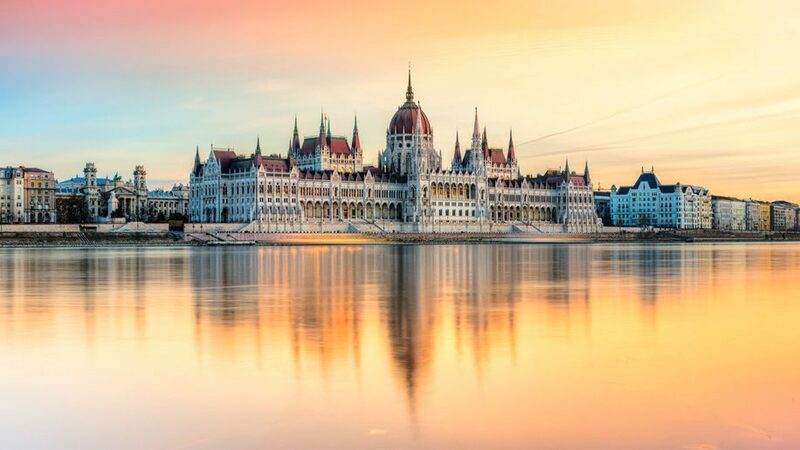 Sunset in Budapest is beautiful wherever you are, but on the board of our luxurious motorboats or river cruises, it is absolutely magnificent! Choose our Budapest sunset cruise and enjoy the adventure. Join one of our dinner cruises or sightseeing cruises or you can rent one of our motorboats with a captain for an absolute romantic sunset experience. Sunset is an experience which can never become boring. Every sunset is unique – and you can discover new features of this marvelous natural phenomenon from month to month. Join us, and enjoy January sunset in Budapest. Imagine this perfect hour: you are swaying on the waves, and all around you there is the performance of the lights. This period of the day is known as ‘the blue and gold hour’! Maybe many people think that January is boring, but they are wrong. In most parts of the year ‘only’ the waves are sparkling, but in winter (with a little luck) you can have a much more amazing experience! If there is a little snow, it reflects the sunbeams, so the river and also the riverside are glittering in the million shades of gold, red, orange, and blue. So in January, you can enjoy the view and the feeling seamlessly! Join us for an amazing experience and enjoy a delicious 4-course dinner on board of our dinner cruises with a live music show. We know that a program cannot be perfect without high-quality drinks. So we offer you an ample choice of soft and alcoholic drinks, e.g. cocktails, wines, champagne or CocaCola. Is it hard to decide? No problem, you can choose our „drink package” with unlimited drink options from a selected list at a favorable price. Budapest sunset time is a unique adventure itself, but you can link it to other programs. In the first month of the year, usually there are concerts, other performances, or sometimes theatre plays in the capital city. Fortunately, sunset comes really early in January, so our cruise can be an ideal overture of your night. If you prefer sporty programs, let’s try the ice rink with your friends in the afternoon – and then let’s have a luxurious rest on our catamaran. Believe us, our cruises suit for every kind of programs! Do not hesitate, choose and enjoy sunset Budapest today! The amazing sunset and our luxurious ships/boats guarantee the eternal memory. Do not miss it! If you are interested in our Budapest sunset river cruises, please find more details about the sightseeing cruises HERE and about the dinner cruises HERE or do not hesitate to contact us via our website or phone.